JBVEF NEWS 2013-09-30 The United States has made peaceful negotiations with countries like Syria, Iran, Yemen, Iraq, North Korea, China and Japan of the Middle East to avoid the manufacturing of nuclear war fares and chemical weapons. Most of these nations are leaning to develop nuclear proliferation for their protections and prevention from other nations such as Israel, India, Saudi Arabia and Russia. 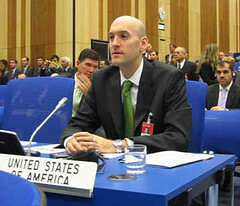 NRC Chairman Jaczko at the 53rd General Conference of the International Atomic Energy Agency in Vienna. The United States strongly rely on agencies like the International Atomic Energy Agency (IAEA) and multilateral military forces to regulate peaceful process using the treaty of “Non proliferation of nuclear weapons” which was put in place in 1970 as states by IAEA. Feasibility studies needs to be conducted to guarantee that activities going on in those countries as listed above. Conditions like these are sure to foster terrorism, may endanger humans lives and invite hunger and poverty to those regions. In the past, humans have become endanger species due to nuclear threat in areas like these. The underline situation is to make sure the treaty signed by the above nations are reviewed periodically and inspection procedures maintained and conducted as documented by the IAEA. IAEA headquarters in Vienna, Austria. Photographed by Sarajevo-x.com, 25 March 2007.